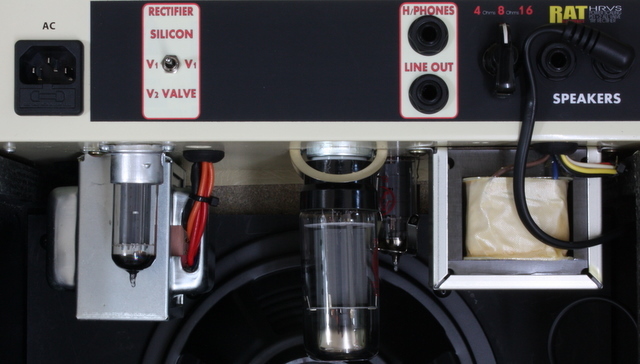 A Switch on the Rear Panel of the Amp Allows the Selection of 3 Different Rectifiers. A. - Silicon - Standard 'Silicon' Diodes. B. - V1 - 'Valve Rectifier' - Running at Half Power. C. - V2 - 'Valve Rectifier' - Running at Full Power. In 'Silicon Mode' the Initial Note Attack is Sharp and Crisp - Like a Modern Amp. In 'V1 -or- V2 Valve Mode' the Initial Attack is Almost Soft and Laid Back with Longer Sustain - Like a Vintage Amp.